Thunderstruck 2 is a sequel game that packs a punch! Since Thunderstruck 2 was released in May 2010 it has won the heart of many British players and to this day is one of the most played game in online casinos. 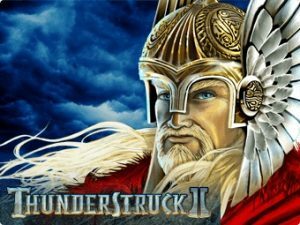 Themed around the Viking gods, Thunderstruck 2 is a 243 ways to win game. The minimum bet on this game is 50p and the max bet is set at £150 per spin. The maximum amount you can win when playing Thunderstruck 2 is 2,400,000 coins. The RTP (return to player) for this popular game is set at 96.10%. Thunderstruck 2 observe one basic fundament, the more bonuses you’ve previously entered the bigger bonus feature you will have access to. You can also win extra rewards by completing the payable achievements. To view these achievements simply press the >> (arrow) symbol located at the top right of the video slot. Thunderstruck 2 bonus feature includes free spins, stacked Wild, extra Wild, and multipliers up to x6. The game is available on a desktop, mobile and tablet and is consider to be a medium volatility game. Thunderstruck 2 has 8 feature symbols all themed around Viking mythology. The Thunderstruck 2 logo is the Wild and Thor’s hammer is the Scatter. The symbol that pays the most is Thor and 5 on a payline will give you 500 coins. The second best-paying symbol is Odin and you’ll receive 450 coins when 5 lands on a payline. 5 Loki will award you 400 coins, and 5 Valkyrie 350 coins. Other game symbols include a rainbow and a Viking longship. The royal suite of A, K, Q, J, 10 and 9 is also present on the reel and the face card pays the most. The game as 5 bonus features, a random based game feature which is the Wildstorm and 4 different free round games which you will need to unlock. The Wildstorm feature is activated when Thor appear in the central bottom reel. At this point, any of the reels can turn Wild and you could get up to 5 stacked Wild symbols. The Great Hall of Spins is the main bonus feature of Thunderstruck 2 and is activated with three or more Scatter. This bonus feature will progressively give you a choice between 4 different free round bonuses. The first time you’ll enter the bonus game the Valkyrie feature will be enable and 10 free round with a multiplier up to x5 will be award to you. The 5th time you trigger the Great Hall of Spins you’ll have access to Loki’s bonus feature. This bonus feature will give you 15 free rounds and with extra Wild symbols (magic wild feature). The 10th time you trigger bonus feature you’ll unlock Odin’s bonus which consists of 20 free rounds with a multiplier of x2, x3 or x6. The multiplier you will receive is based on the number or raven that will land on the reel. Thor is the last bonus round you can enable. It is available from the 15th time you trigger the Great Hall of Spins. Thor’s bonus feature includes 25 free spins with a multiplier of up to x5. Each consecutive win will increase your multiplier. Additional free rounds can be earned with 2 or more scatter symbols depending on the bonus feature you choose to play. If you’ve enjoyed playing Thunderstruck 2 here’s a few other games you might like. Immortal Romance is very similar to Thunderstruck 2 it offers an achievement builder feature, free spins, and stacked symbols. When you play vampire theme game you could win up to 3,645,000 coins. Is also an achievement builder slot themed around a popular 90’s board game. When you play this fantasy game you can win up to 125,000 coins. The slot feature includes free spins, stacked Wilds, and multipliers. Is themed around the legend of King Arthur and offers an achievement builder feature in it, stacked symbols, and free spins. The maximum win on this game is set at 20,000 coins. Thunderstruck 2 is a fantastic game where you could potentially win a life-changing amount of money. It is entertaining and rewarding to play multiple rounds in this game. You should make sure to only play this game on one device as the bonus feature you’ve previously unlocked on are not carried over across devices. This game can sometimes be excluded from the wagering requirements of a casino bonus.